The P-39 was one of America's first-line pursuit planes in December 1941. It made its initial flight in April 1939 at Wright Field and by the time of the Pearl Harbor attack, nearly 600 had been built. Its unique engine location behind the cockpit caused some pilot concern, but this proved to be no more of a hazard in a crash landing than with an engine located forward of the cockpit. However, the P-39's spin characteristics could be quite a problem if recovery techniques were ignored. 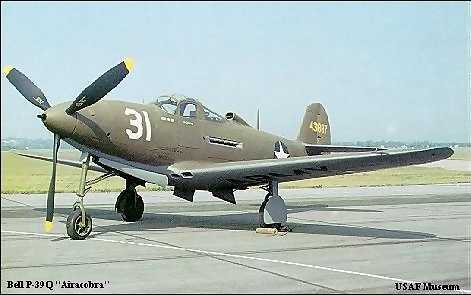 The Airacobra saw combat throughout the world, particularly in the Southwest Pacific, Mediterranean and Russian theaters. Because its engine was not equipped with a supercharger, the P-39 performed best below 17,000 feet altitude, and it often was used at lower altitudes for such missions as ground strafing. When P-39 production ended in August 1944, Bell had built 9,584 Airacobras, of which 4,773 had been allotted to the Soviet Union. Russian pilots particularly liked the cannon-armed P-39 for its ground attack capability. Other P-39s served French and British forces. The P-39Q shown here was obtained by the Air Force Museum Foundation from the Hardwick Aircraft Co., El Monte, California in 1966. It is painted as a P-39J flown by Lt. Leslie Spoonts of the 57th Fighter Squadron in 1942 while based on Kodiak and Adak Islands during the Aleutian Campaign. One 37mm cannon firing through the propeller hub; two .50-cal. machine guns in the nose; two .50-cal. machine guns in packets under the wing; 500 lbs. of bombs externally. Engine: Allison V-1710-85 of 1,200 hp.